To say the Dyson Cyclone V10™ is one of the world's most technologically advanced vacuum cleaners is an understatement. 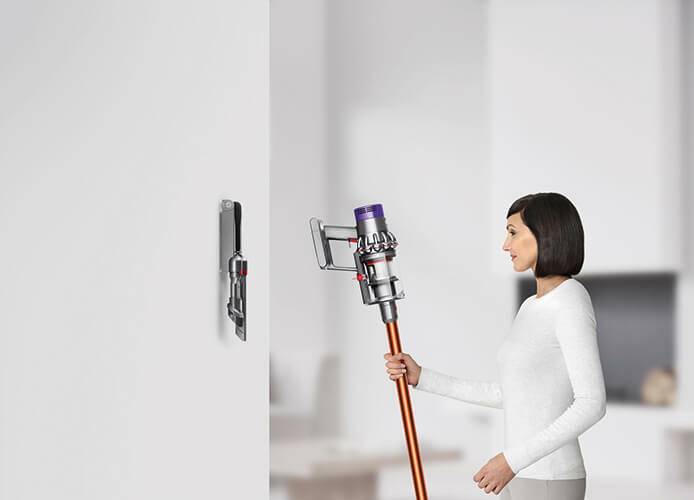 With a smaller and lighter digital motor, the cord-free model is the latest powerful stick vacuum cleaner from Dyson. In fact, the brand has done such an incredible job with this class-leading model that it has effectively ended the development of big, heavy corded vacuum cleaners at the British technology company. Since its establishment in 1991, Dyson has gained a reputation for producing cutting-edge household appliances. The vacuum cleaner remains one of the products it is best known for and the company has certainly outdone itself over the years with models that have set the bar in the segment. In 2009, Dyson became the standard bearer again with the introduction of the digital motor V2, which weighed a mere 150g but was capable of spinning at 104,000 rpm. Over the years, its engineers have been continuously improving the motor, resulting in the latest and most advanced V10, which is found in the Dyson Cyclone V10™. Weighing almost half the weight of its predecessor, the V10 is Dyson's fastest and most power-dense digital motor. Spinning at up to125,000 rpm, it is the heart of the Dyson Cyclone V10™, generating powerful suction with all the versatility that comes from the cord-free format. According to founder James Dyson, the new motor has enabled Dyson's engineers to change the format of a vacuum cleaner entirely, allowing the company to achieve its best-ever cord-free machine performance. 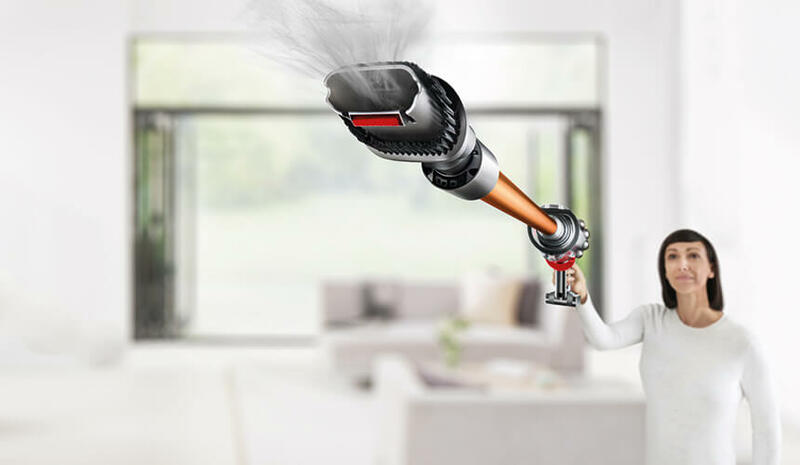 "The Dyson Cyclone V10 vacuum cleaner is so light and powerful that it can deep clean anywhere in your home. It is the reason why I've stopped developing full-size vacuum cleaners." The V10 motor has eight poles, allowing it to switch faster - up to 16,000 times a second - for unprecedented high performance. To channel more airflow, the designers have re-engineered the impeller for a longer narrow layout as well as equipped the motor with a lighter, stronger and more durable ceramic shaft for improved efficiency and power. The Dyson Cyclone V10™ delivers optimum performance at all times, thanks to its motor, which intelligently adjusts to its surroundings. Using pressure sensors, the motor registers the altitude, barometric pressure and temperature and uses that data to make minute adjustments to deliver constant performance. The Dyson Cyclone V10™ is designed around its new motor. By rotating the cyclones and bin assembly through 90°, the vacuum cleaner benefits from a linear airflow path and a point-and-shoot bin emptying mechanism. Unlike other cyclonic vacuum cleaners, where dust and dirt are not efficiently separated from the airflow, resulting in a choke point on the filter - causing suction power to decline - the Dyson Cyclone V10™ delivers constant suction power. The 14 cyclones are precisely arranged around the central axis of the machine, enabling the airflow inside each cyclone to travel at up to 120 miles per hour, generating over 79,000G, separating even microscopic dust from the air efficiently. With pre and post-motor filters wrapped around the motor as one completely sealed unit, the vacuum cleaner achieves improved whole-machine filtration, capturing 99.97% of allergens as small as 0.3 microns.? 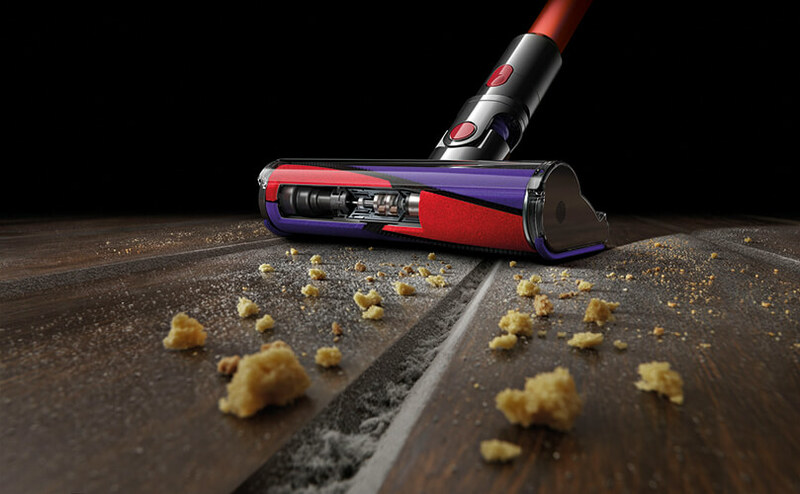 To ensure maximum performance, Dyson's engineers have equipped the vacuum cleaner with a more energy-dense battery. Along with improved electronics and battery system management, the new power unit gives the vacuum cleaner up to 60 minutes of suction. With its trigger switch, as opposed to the traditional on/off switch, the machine shifts to operating speeds in a fraction of a second. The Dyson Cyclone V10™ is one of the best and most complete vacuum cleaners available on the market today. It is equipped with features such as a new direct-drive cleaner head -available on the Absolute and Absolute+ , which is powered by a strong motor inside the brush bar. This allows the stiff nylon bristles to be driven deep into carpet piles to remove ground-in dirt and pet hair. The fluffy head, a larger roller covered in soft woven nylon, which is designed for hard floors, traps large debris while anti-static carbon fibre filaments removes fine dust. The vacuum cleaner also sports a direct-drive motor within the roller, allowing full-width, edge-to-edge cleaning for better all-round performance for a cleaner home. With a cutting-edge and technologically advanced design, the Dyson Cyclone V10™ is undoubtedly one of the best vacuum cleaners in the market today. If you're on the lookout for an efficient, durable and powerful vacuum to take care of your household cleaning needs, look no further than this best-in-class product from Dyson. It literally leaves its rivals in the dust.